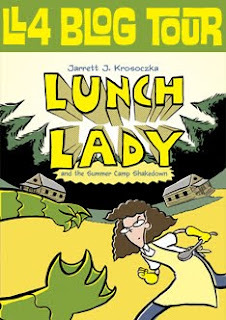 I have to start this review by saying that I already am a big fan of author/illustrator Jarrett J. Krosoczka and the Lunch Lady series -- see this and this! So when the opportunity came to participate in a blog tour for the fourth Lunch Lady book, LUNCH LADY AND THE SUMMER CAMP SHAKEDOWN, I jumped at the chance! I'm excited to say that LUNCH LADY AND THE SUMMER CAMP SHAKEDOWN had everything I've come to expect (and love) from a Lunch Lady book! It was filled with terrific illustrations and a very entertaining storyline. I just know kids are going to gobble up this book! The fourth book takes place in a different setting than the first three -- a summer camp. Dee, Hector and Terrence, as well as Lunch Lady, head off to a summer camp where they hope to have an event-free vacation. But they quickly realize that something is amiss when they find evidence of a swamp monster. Of course, Lunch Lady (with the help of the three kids) solves the mystery using her famous food-related weapons. While I definitely enjoy the characters and the plots in the Lunch Lady books, I have to say that the biggest draw to me, as a parent, is that even the most reluctant readers will love these books. The illustrations are adorable and there aren't too many words per page. These books are geared towards ages seven to ten, and I think it's fairly safe to say that kids in that age range won't get frustrated reading these books. Needless to say, I just think the Lunch Lady book books are terrific. And even though my daughter is reading at a higher level, she always grabs these books right away and scurries off to read them. This book also caught my five year old son's eyes and he asked me if it was a book for little boys. I'd just love it if his interest in this book would fuel his interest in reading! I am extremely flattered that the author and illustrator of the Lunch Lady books, Jarrett J. Krosoczka, has taken time to write a guest post for Booking Mama. Keep on reading to get an insider's look into the inspiration behind the Lunch Lady series! Way back in 2001, I was celebrating the release of my first picture book, Good Night, Monkey Boy, and went back to my old elementary school in Worcester, MA to talk to the students about being a writer and illustrator. When I was there, I ran into my old lunch lady. I hadn’t seen her since I was a kid and I just had to go over to say hello. She at first mistook me for my uncle, who is twenty years older than I am, a clear sign of her years of service! When I introduced myself, she remembered me and began to tell me about what she had been up to, her grandkids, etc. It blew my mind! My lunch lady had kids who then in turn went on to have kids? Suddenly images of my lunch lady as the grandmother to a family at holiday parties flashed in my mind. And to think, all this time, I thought she lived in the kitchen with the tater-tots! Lunch Lady uses weapons like the fish stick nunchucks and the spatucopter to stop the bad guys, while spitting out expressions like, “Who’s ready for a knuckle sandwich?” or “Should I serve up some whaaaamburgers and cries? !” The fourth book, LUNCH LADY AND THE SUMMER CAMP SHAKEDOWN, was just released and I’ve already finished the 5th book and am hard at work on the 6th book. I hope that you enjoy reading the books as much as I have enjoyed writing and illustrating them. Thanks to the publisher for sending me a copy of this very fun book. And a huge thanks to Mr. Krosoczka for writing this special guest post. The books look like so much fun and I just love the guest post! It made me laugh because I can remember when Vance thought his teacher lived at school. Hi Julie! Thank you so much for having me on your blog!! But more importantly, thank you for your enthusiasm for my work! So glad you and your kids are enjoying the Lunch Lady books!!! I hadn't heard of this series (yet again!) but this sounds like so much fun! I love the idea of solving mysteries with food-related weapons! Thanks for the fun guest post! Just put this series on hold at the library for my 7 year old stepson. He is going to love them! These books look like a ton of fun. And I agree that both boys and girls and even adults would get a kick out of them. I love the Lunch Lady's cries (or is that fries!) and the story behind the books.